No NFL team wants to go a single practice, let alone the entire preseason, without one of its best players on the field. Yet as much as the Seahawks want to have Pro-Bowl receiver Doug Baldwin back in action—and he is expected to be ready for Seattle’s regular-season opener—there has been a silver lining in his absence, as well as in Tyler Lockett sitting out last week’s preseason game with a sore toe. With Baldwin sidelined by a sore knee, and with Lockett’s brief absence, what has become evident is just how deep and competitive the Seahawks are at receiver. Baldwin and Lockett are Seattle’s top returning receivers from last season, and their spots on the 2018 roster are all but etched in stone, but coming into camp there was a lot of uncertainty beyond those two, especially with 2017 starter Paul Richardson leaving in free agency. Yet during training camp and two preseason games, any concern there might have been about that position group has been replaced by excitement about the players who have stepped up and turned the competition for playing time and roster spots into one of the best position battles on the team. In last week’s loss in Los Angeles, free-agent signing Jaron Brown led the team with 74 yards on two catches, just ahead of David Moore, who had two catches for 71 yards. Cyril Grayson Jr., meanwhile, added a 39-yard grab to help set up a late touchdown to Malik Turner, then Grayson did his best Baldwin impression on a 2-point conversion, using good footwork at the line of scrimmage to get wide open in the end zone. 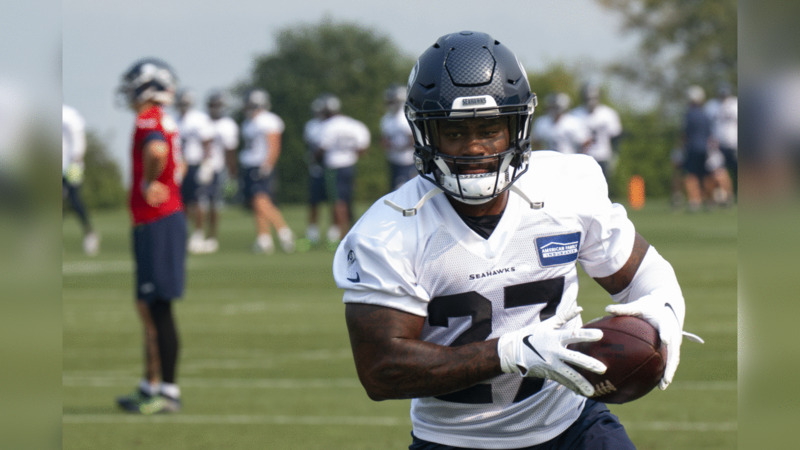 Meanwhile veteran Brandon Marshall, a six-time Pro-Bowler, has been one of Russell Wilson’s most productive targets in practice, and we still haven’t gotten to Amara Darboh, a 2017 third-round pick for whom the Seahawks still have high expectations, or Marcus Johnson, who was a part of the trade that sent Michael Bennett to Philadelphia and who in addition to making plays in practice has also been a core special teams player in two preseason games. At times in various seasons, the Seahawks have kept as few as five and as many as seven receivers on the 53-man roster, but six has been the most common number, and if the Seahawks indeed open the season with six receivers, there are going to be some very difficult decisions to make for those final spots. And while Marshall was the biggest name added this offseason—and has been very impressive since joining the team—he is just one of several new players making their mark at receiver. Brown, who has been one of the team’s most productive receivers in practice and preseason games, spent his first five seasons in Arizona primarily in a backup role. Brown has seen a lot of time with the No. 1 offense and is looking to show he can be more than the role player he was on an offense that featured the likes of future Hall of Fame receiver Larry Fitzgerald. Johnson, who played at the University of Texas, also went undrafted before signing with Philadelphia. The Seahawks were one of the teams pursuing him as an undrafted free agent, Johnson said, and though they didn’t get him at the time, they were able to acquire him this offseason as part of the Bennett trade. Johnson has made a lot of plays in practice as a receiver, but he also knows his best chance to make this roster might be by standing out on special teams. “It’s huge for me, being undrafted and in this league in general, it’s what have you done for me lately?” said Johnson, who started at receiver along with Brown in last week’s game. And while Johnson obviously didn’t have any say in his fate this offseason, he does appreciate that the Seahawks thought enough of him to make him part of a trade for a Pro-Bowl defensive end. In addition to newcomers making their mark, there’s a group of young returning players looking to step into bigger roles, led by a pair of 2017 draft picks, Darboh and Moore. Darboh, a third-round pick, has been limited by injuries in camp, but when he’s healthy he’ll be right back in the competition to show what he can do. Meanwhile Moore, a seventh-rounder, has made one of the biggest leaps of any second-year player. After spending most of last season on the practice squad, Moore earned a late-season promotion, and returned this year looking not just like a player who can make the team, but like a player who could really help the offense. It’s too soon to know what receivers will end up on Seattle’s 53-man roster or will earn significant playing time at that spot, but what is clear following training camp and two preseason games is that, despite some uncertainty heading into camp, receiver has become not only one of the most competitive positions on the roster, but also one of the most fun to watch. Photos from Wednesday's practice at Virginia Mason Athletic Center in preparation for Friday's game against the Minnesota Vikings.